Start your weekend right with tacos, beer, and fun every Friday. 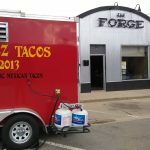 Tinez Tacos will now be at Forge Brewhouse serving delicious authentic tacos every Friday! Special and new beer tappings will be on Fridays.